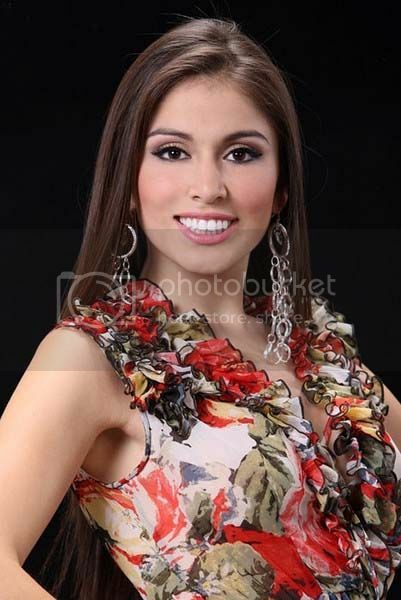 Notes: Odilia Garcia was crowned Miss Peru Mundo 2011 during the Miss Peru Universo-Mundo 2011 beauty competition. She was also top 8 semi-finalist at Miss Earth 2007 pageant. Odilia is studying law at University and intends on pursuing a career in international law. Odilia loves Peruvian home cooked food, going to the cinema, meeting new cultures and interpretative dancing. Peru has honest, warm and hard working people who are rich in spirit and strive to raise Peru. It has a very important cultural and archaeological heritage like Machu Picchu which helps me keep in mind where I come from. I wish to develop myself as an international lawyer with success in NGOs. I am a very optimistic person with a great desire for self-improvement. I always place a lot of enthusiasm in everything I do and attempt to do everything in my power to achieve my goals in life. Go ahead, visualising your goals with a positive mind, self-confidence, living life to the full and always respecting the rights of others. I love Peruvian food, especially if it’s homemade. My favourite music is pop, house, classical and salsa music. I enjoy reading novels and personal growth books. Yes, I have a Collie named Lassie. My proudest moment was being told I had been accepted into university to study my desired career in law. I studied interpretation last year.